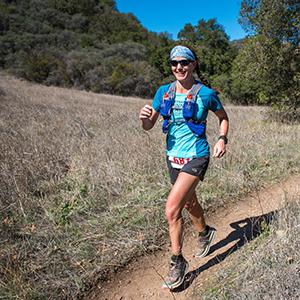 I took up running and training for marathons two decades ago, during graduate school in my mid 20s, and gradually I switched my focus to trail and ran my first trail marathon in 2005, on Mount Diablo. I’ll never forget it because I lined up behind Scott Jurek, who was doing the 50M division as training for Western States, and I thought, “What am I doing lining up behind Scott Jurek?! I have no idea what I’m getting myself into!” I placed 2nd F and near the top overall in that hot, grueling mountain marathon (admittedly, it was a very small, low-profile race) and was hooked. I’m turning 47 this year and have run some 70 marathons and ultras, most of them trail events. An erstwhile newspaper reporter who got a degree from UC Berkeley’s Graduate School of Journalism, I’ve been a writer for Trail Runner magazine for nearly ten years, and a couple of years ago I also began co-hosting UltraRunnerPodcast.com on a somewhat regular basis. My proudest moments as a trail/ultra runner include: twice finishing as the age-group winner and female podium finisher in the seven-day, self-supported 170-mile Grand to Grand Ultra (2012 and 2014); finishing sub-22 hours and first rookie in my first 100-miler (Rio del Lago 2014); finishing an incredibly slow and painful 32-hour Wasatch 100 in 2015 when I was on the verge of passing out and DNF’ing; winning a 24-hour event with one-mile loops (SF Summer Solstice 2015); and three times pacing and surviving insane weather conditions on stretches of the Hardrock 100, which I hope to get into and complete some day. My proudest moments in life involve giving birth to and raising my two kids, who are now 18 and almost 15; and living a nomadic, one-bag-each life for a year in 2009-10 while traveling around the world. During that year, I taught my kids the equivalent of 6th and 3rd grade on the road, developed a popular family travel blog, and participated in as many running events in different countries as possible while traveling. After I returned to our home in the East Bay Area town of Piedmont, I launched my current blog, TheRunnersTrip.com, to combine my twin passions of trail running and authentic travel. I’m also proud that I’ve studied to be a coach and gained RRCA certification, so I started coaching in 2014 and have helped several dozen clients since then (both road and trail runners, sub-ultra and ultra distance) achieve their goals. When I’m not running, writing or coaching, I devote a great deal of time as a trustee and chair of the Development Committee on the board of the Thacher School, where I went to school and where my kids now attend. I’m also very excited that my husband and I are embarking on an adventure and fulfilling a dream of moving to Colorado to live there part time, where we plan to design and build a cabin near Telluride, across from family property where I spent every summer of my childhood. If anyone wants to visit while training for Hardrock or other high-altitude events, please do! Favorite running memory: This is an impossible question to answer, because I have no single favorite memory, but I’ll share one: The sensation of finishing my first 100-miler (Rio Del Lago) in the middle of the night running hard and fast, much stronger and faster than I had anticipated, savoring the feeling that I had nailed it and exceeded my goal by finishing sub-22 hours.